Pants - Target....good old faithfuls. Top - Temt a couple of seasons ago..... I've worn it to death....and so has Briony. I still like it...but not nearly as much. Tempt is one of my fav stores at the moment. 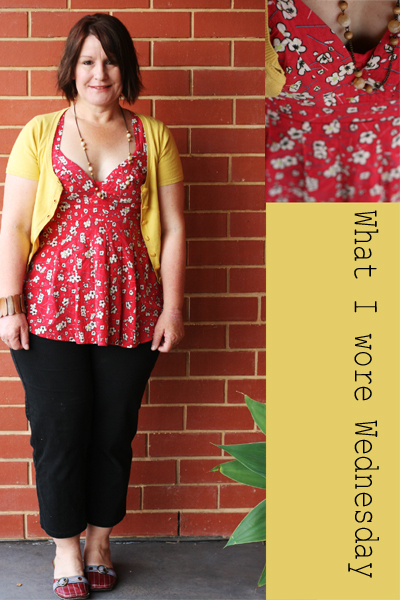 I love that red top its so pretty and teemed with the yeloow cardy is very spring! georgeous outfit Mardi! Those shoes are too cute!!! Red and yellow really suit you Mardi, a lovely photo. Thanks for sharing with us again. Happy belated birthday wishes to Bella. I can't believe she is now 3 years old. Time flies doesn't it. She and Brooke are such pretty girls. I love seeing your photos of them. What a cute outfit Mardi! I love that gorgeous top! Oh I love that top and cardi together! What a killer combo! I think I remember seeing pics of Briony in that top before too!